Looking for things to do in Pigeon Forge without breaking the bank? Choose from a number of budget friendly and free things to do in Pigeon Forge, Tennessee so you can explore the area and save money along the way! Experience the Great Smoky Mountains National Park, one of the most visited national parks in America. 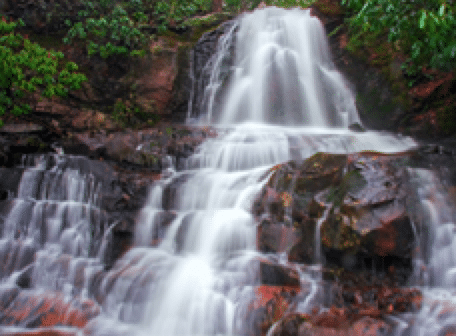 The park boasts more than 800 square miles of wilderness and is home to the largest flowing mountain streams, as well as a number of absolutely stunning waterfalls. Choose from several hiking trails throughout the National Park, designed for all levels of adventurers. Wanting to enjoy a beautiful walk by the river? 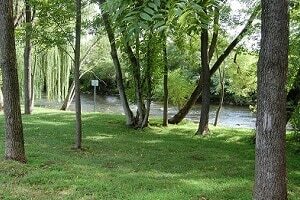 Take an afternoon and explore the 2-mile walking trail located by the Little Pigeon River. 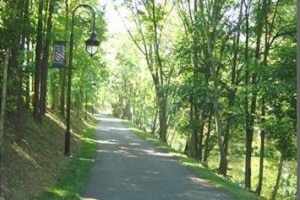 Entrances to the Riverwalk Greenway can be found at Patriot Park, Butler Street at Ashley, and Jake Thomas Road. Everyone in the family will enjoy walking or biking the trail and listening to the soothing sounds of the river along the way. Enjoy the great outdoors, relaxing in natures very own lazy river. The entire family can enjoy an afternoon of floating down the Little Pigeon River without breaking the bank (tube rentals range from $9 – $14 for the day). Make sure to pack your swimsuits and sunscreen for this exciting adventure. Most tube rentals are located around 5 miles from Dollywood. 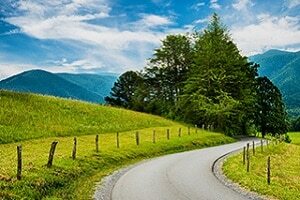 Take a scenic drive through Cades Cove. The 11-mile paved Cades Cove Loop Road is one the most visited areas within the Great Smoky Mountains National Park. Enjoy breathtaking views of the Smoky Mountains, look for wildlife and get a peek at the historic church and other buildings. Pack a lunch and stop for a picnic at the Cades Cove picnic grounds. The park is open year-round and free. Wanting to explore the great outdoors from the comfort of your own car? The entrance to the Roaring Fork Motor Nature Trail is near the Rainbows Falls parking area, where visitors are immediately met with spectacular views. Make sure to bring your hiking shoes as there are plenty of places to get out and explore with the family. The best thing about this beautiful drive is it”s FREE! Travel back in time with a visit to the Old Mill Square. Walk through the square and take a peek in the unique shops and stores. See fudge being made at the Old Mill Candy Kitchen. Feed the ducks along the banks of the Little Pigeon River and watch the wheel turn on the side of the mill. Tour the Old Mill to see it working, to make some of the ingredients that are used in Old Mill recipes. Excited about seeing Dolly Parton’s Stampede dinner show? Get there early and take a leisurely stroll along the open-air horse walk in Pigeon Forge. Get up close and personal with these magnificent creatures. 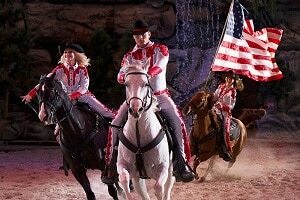 Meet the performers and learn about each breed of horse. This is a great experience for everyone who is attending the show and its open to the public. Get your tickets to Dolly’s Stampede today. 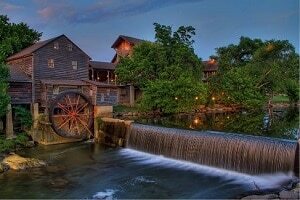 Take the family for an afternoon at Patriot Park, located next to the Old Mill in Pigeon Forge. A walk around the park takes you along the Little Pigeon River, where you”ll see a big “liberty” bell, flags from the 50 states, a historic patriot missile and a picnic pavilion. During Winterfest and the holiday season, Patriot Park lights up the night with magnificent holiday light displays. 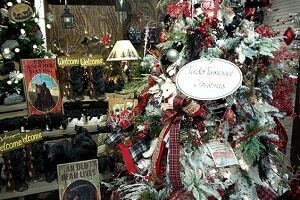 Celebrate the spirit of Christmas any day of the year with a visit to The Incredible Christmas Place in Pigeon Forge. See their large display of Christmas trees brilliantly decorated with lights and ornaments. There”s no cost to browse through the store. 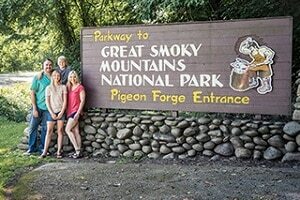 Explore more fun trip ideas to help you plan your next visit to Pigeon Forge and the Smoky Mountains.